Relax and enjoy the Lake, Mountain Views and nature galore, on over 6.5 acres of privacy. Our 1st floor of our home was designed for the upmost enjoyment of our guests, we offer all the amenities one would expect when away from home and so much more. Limited weeks available so reserve early and dream of the ultimate relaxation the Lake, Mountains and Nature will have to offer you. We have nothing but happy guests for over 15 yrs running. There is over 2200 sq ft of living area to enjoy. Golfers... only a one minute drive to Chatuge Shores championship 18 hole Golf Course, Brasstown Valley Resort and The Ridges... and boating, fishing, jet-skiing, and swimming only half mile away... or just relax on the lounge chairs in the expansive 12' X 60'(glassed in w/screens) deck enjoying the beauty of nature, Lake Chatuge, and the mountains. Very private... no traffic... and paved roads all the way to Crow's Nest. Please feel free to enter your comments in the comment section if you enjoyed your stay, we love hearing from you! After coming to the mountains since 1995 we have chosen this location for the views and tranquility the area offers not too mention the lack of traffic congestion. Although we built in 2002 the property is always being updated. The latest update was finishing the downstairs in 2016. We are so very close to the golf course and shopping and we feel we have more here to rent then just a house in the mountains it is a home taken care of with love. If you read the reviews I believe you will see everything has been maintained. . The view of the lake and mountains make having coffee or a glass of wine in the patio very relaxing. The ride up is easy the view is beautiful we have deer in our yard almost all the time because we have fed them for 14yrs. It is quiet and private without being in the back woods. . Just look at our reviews! All Electric Stainless Steel Kitchen, Gas Grill (BBQ), Granite Counter tops, No pets, small children, smoking outside please Please feel free to enter comments in the comment section if you enjoyed your stay! 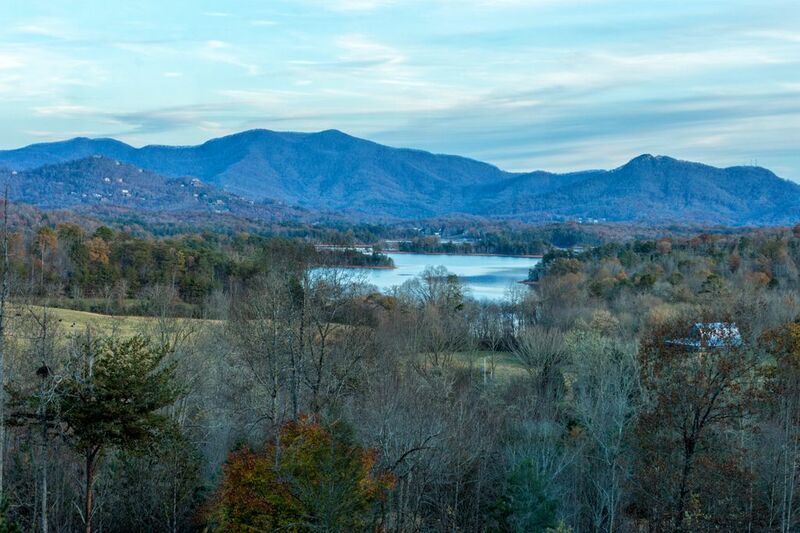 Amazing views of the mountains and Lake Chattuge! Peaceful but at the same time easy access! Since the day I make the reservation everything was very pleasant. Beth and Tom where very helpful and nice. The property is well situated with incredible views! Easy paved roads access, perfect parking space and absolutely privacy! The property inside is beautiful! Everything is new and modern and very clean. Plenty of lines and well equipped kitchen! Good internet service and TV. Close to towns, groceries, places to eat and wineries. Beth and Tom are great hostess! The weather for us was great but only looking at the view from the ample terrace will be enough to entertain! We saw deers every single day! Lake Chattuge recreation area is very close if you like to stroll and enjoy a closer look of the lake and the surrounding mountains. Plenty of antique stores close by. Definitely a place to consider for a get away on the mountains! We just leave and are ready to comeback! When our reservations were made in early spring for two weeks, Crow's Nest looked like the perfect place. Google Earth showed it had plenty of privacy and parking with paved access. Upon arrival we heard dogs barking as the owner met us in the drive way. He explained they live upstairs and had small dogs. We also had to share the parking with their two cars that were parked in the garage. This is not we expected and did not stay. We feel if there had been more clarity about these details we would have chosen a different place for our stay. The lack of this information ultimately ruined our vacation. Although they did return one week of our payment, we should have gotten both weeks back. Sadly the disaster was of their choice. The parking area is 56'X48' room for 3 guest trucks or cars and still access to the garage, it has been done many times. They tried for over 35 minutes to park the trailer without success. I offered to park it for them 3 times but they declined. I have parked guest trailers for them in the past, the combo of truck & trailer length requires experience. I asked if they would like to tour the first floor in person, they declined. They then informed me they were going to a rental they had stayed before, it offered straight through driveway making trailer parking easier. Their reservation was made over 6 months in advance leaving ample time to reach out with any questions regarding the residence, we received no communication. Our goal has and will always be too offer 5 Star, Private and Peaceful setting during our guests stay. I believe our positive reviews speak for the many who have enjoyed our home. Our commitment to our future guests will always be a top priority to ensure an enjoyable stay. Solutions were offered but declined, sad they could not see what might have been a very enjoyable stay. Future guests feel free to call us with any requests our questions this could have been avoided. This property was exactly what my daughter and I were looking for. A quiet, small town feeling, close to many areas we wanted to visit. The property was well kept, and the view from the sunroom was spectacular! What a view and so easily accessable too! What a wonderful, modern, beautifully decorated, open concept 2 bedroom apartment with a 60 foot long glassed in porch ( screened windows), which open to a beautiful view of the mountains and lake. It is just up the hill on a paved easy drive from the Chatuge Shores Golf Course if you are into golf. Restaurants, the lakeside parks and shopping are very conveniently nearby. We were here just a week this time, but have stayed here for a month the past two falls and a couple of weeks in the Spring the past couple of years. This is our "home" in the mountains and we are looking forward to our time there this fall. Tom and Beth are wonderfully friendly and are always so accommodating. We are sure you will love this place as much as we do! Tom and Berh your property is outstanding. Unique design with private entrance and totally private living area just like a single family home, the views are some of the best Ihave seen. The decor is top quality ( not your average rental ) . Location is close to everything, shopping, lake, mountains, hiking, boating. Looking forward to a return trip. That you for the kind review. We enjoyed having you stay with us and hope for a return visit soon. Beautiful home, beautifully furnished. The view from the large screened room is breathtaking, overlooking miles of mountains and Lake Chatuge. Beth and Tom are kind, thoughtful hosts who respect the privacy of their guests. This rental exceeded our expectations. Even the most selective renters will be pleased.